← American Dad Phase 3 is Here! I was quite shocked and very happy to get this delivered to me today. It was not anything I was expecting to get, so a welcome surprise. It’s for sure a gift made for someone with my sense of humor. I seriously just pulled it out of the box and laughed. I showed my friends that were with me at the time. They all burst out laughing too. We all were literally in tears for a while just looking at this Vinyl Peter. The simple yet silly details on him. From the stockings, to the lil bit of crack in the back, to the glasses on his head, this was definitely a toy I could love. I adore those that sent him to me even more so. THANK YOU!! I do own other vinyl toys and this one is by far the biggest of them (the rest are around 3″-4″), so I burst out laughing at the size of it. 7″ is a lot bigger than you think when you put it into perspective with another 3″ vinyl right next to it. Is it bad of me I want to put him by my nightstand so it’s the first thing I see when I wake up? That’ll put a smile on anyone’s face first thing in the morning. Now for those of you that my not be quite familiar with the Intimate Apparel version of Peter (Black Outfit) and why it makes me giggle, just take a lil time to go watch Season 4, Episode 14: PTV. It is only there for a quick flash during the FCC song. But just like this silly lil game, something that appears for only a few seconds can become a focal point. So now I KNOW you’re gonna want one of each for yourself too, right? Well there are some great ways you can go about getting one. These are Limited and WILL sell out. TinyCo, being their usual awesome selves, has also introduced a way for you to enter their Giveaway for one. Just check out their Family Guy: The Quest For Stuff Facebook Page for all the rules and details on it. TinyCo even took it one step further and introduced a Costume for Peter in their Family Guy: The Quest For Stuff Game. So now you can have a chance to get Intimate Apparel Peter roaming around your game too. How cool is that? His is a riot to watch. Intimate Apparel Peter’s tasks are hilarious! 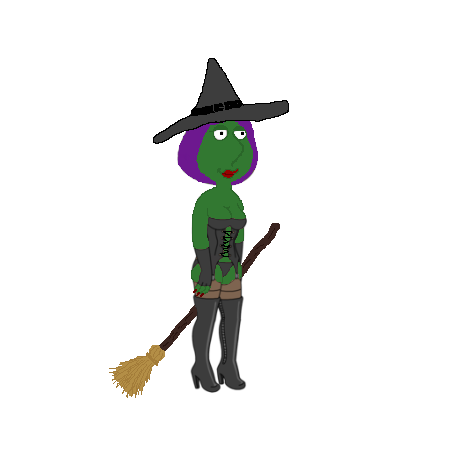 You can find more details on Intimate Apparel Peter in the Family Guy: The Quest For Stuff Game from Family Guy Addicts HERE. BUT WAIT, THERE’S MORE!!! FAMILY GUY ADDICTS ARE HAVING A GIVEAWAY TOO!!! WOOHOO!! You know we love our readers and love to spoil you, so we also are going to be having a Giveaway for a total of TWO Intimate Apparel Peters. 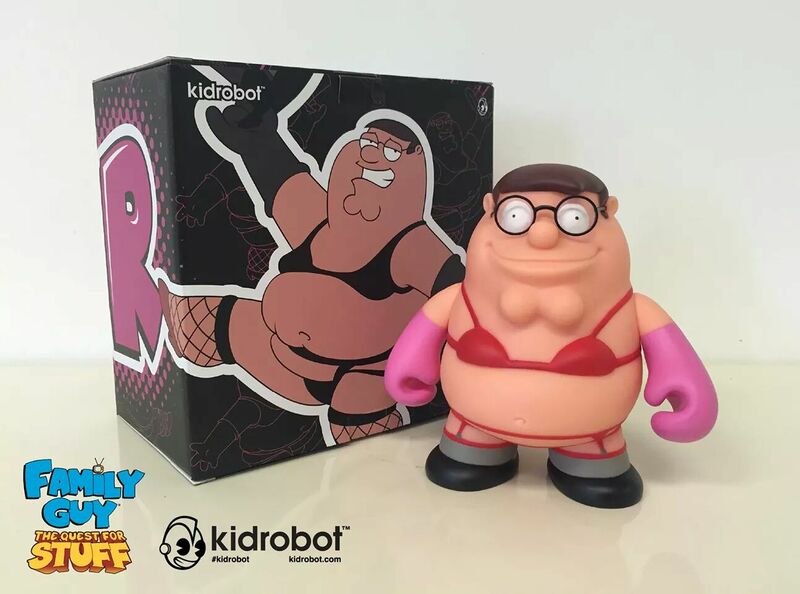 So two of our lucky readers here at familyguyaddicts.com will be chosen at random to receive one of the two Intimate Apparel Peter. HOW DO YOU GET A CHANCE TO GET INTIMATE APPAREL PETER FROM THE FAMILY GUY ADDICTS? Like and Retweet this Giveaway Post from our Family Guy Addicts Twitter Account. Like and Share this Giveaway Post from our Family Guy Addicts Facebook Page. NOW FOR THE LEGALITIES. MAKE SURE YOU READ THEM ALL. Go to bit.ly/KRLegal for the complete details. In addition… Employees of Family Guy Addicts, TSTO Addicts, Up All Night LLC, and the immediate family members and persons living in the same household of each are not eligible. 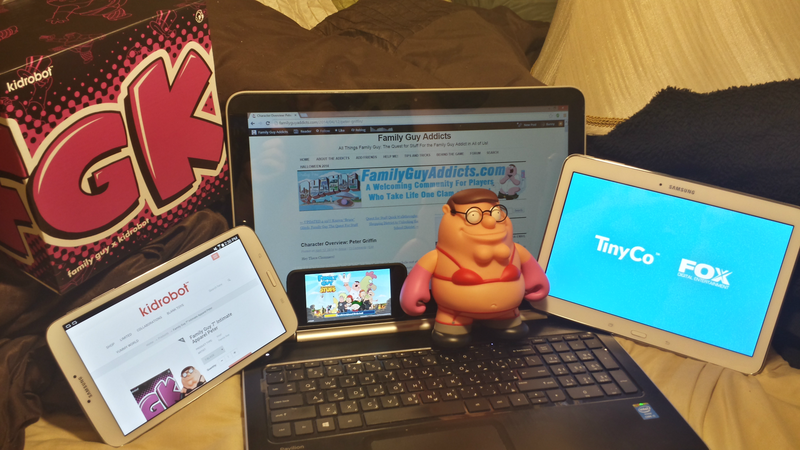 The Family Guy Addicts Giveaway will end on Saturday, November 29th, 2014 at Noon, Eastern Standard Time. ARE YOU EXCITED NOW??!! I know we are! Good luck to all!! This entry was posted in Contests and tagged Family Guy Addicts The Quest For Stuff, How can I buy Intimate Apparel Peter, How can I get Intimate Apparel Peter?, How can I get kidrobot 7" vinyl free?, Intimate Apparel Peter, Intimate Apparel Peter Giveaway, kidrobot, TinyCo, Where did Intimate Apparel Peter Come From. Bookmark the permalink. I have to say that I stumbled onto the giveaway while looking for something else entirely. I use FGA all the time if I get stuck on quests or, as was the case this time, to ensure I am working on the right questlines to unlock my next goal. FGA is an awesome site, and is the first place I go when I need tips on the game. Keep up the awesome job!! Happy Thanksgiving!!! Even if such a holiday is not present where you are…Look around at the fragility of things worldwide…We all are thankful for many things, it just takes a minute. This site is great, very informative. I am thankful for the hard you do to help us in our quest for stuff! Thanks! I’m thankful for all the great info you guys put on here! I really helps! Thanks for everything you guys do for the FGQFS community! I read this site (and play the game) way more than I probably should! I am thankful for Bunny, Alissa and the Family Guy Addicts site. Ok ok ok… Where to begin? Soooo I’m thankful for this site and all the info that y’all provide! I’m also thankful for my family and friends who don’t judge me for playing this game all the time (and for those few who even joined me :D). Keep up the good work! And seriously where’s roger when you need someone to run the underground businesse “employees” back in line? Uh, I am a U.S. resident, but I’m on vacation in another country. Is that ok? 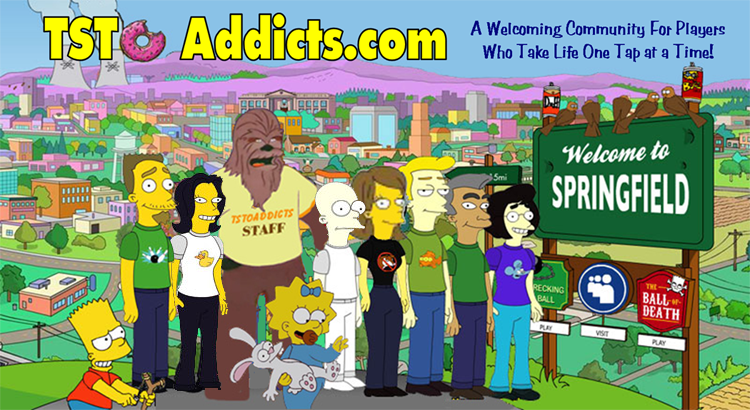 I am thankful for my family and friends also this site which is awesome! Thankful I’m sucking oxygen someone else could be breathing! I am thankful. That’s it. I’m thankful that I’m healthy, and that my family is healthy. I am truly thankful that my husband hasn’t found out just how much I’ve spent on clams. I’m John Wayne at the first Thanksgiving, pilgrims. HAPPY THANKSGIVING, pilgrims. So much great information for the game and you even do giveaways. You guys are the best. Love the tips and explanations of the events! I am thankful I found this site to help me with this game. I’m thankful I was only one item away from completing intimate peter with two guys grinding for it and completely missed out when he ended an hour before they popped. And today is opposite day. I really wish the app had put in countdowns like they did at Halloween,or at least put it in his description in the costume store clearly stating when this ended. I deliberately missed a few opportunities wasting 12 hours of grind time on roger and hayley quests and could have easily finished it but I assumed midnight, not 3pm…. But what I am truly grateful for is that burning myself like this led me to finding the familyguyaddicts.com website so this will never happen again. Thanks guys! Your information is awesome! I’m thankful for you all loving this game and sharing the info with us. Thanks and happy gobble gobble! I am thankful for my fiancé. I love this page and the game. And I love Intimate Apparel Peter. I’m thankful for such a helpful and fun site and all of the great additions and updates for this game! It’s so enjoyable and addictive! I’m also thankful for all of my blessings including my friends, family and boyfriend. Happy Thanksgiving everyone!! Sending love and happiness!! Oh no my email address was deleted somehow from my last comment! Very thankful for my 6 awesome kids and 1 granddaughter. .. I love this site because it keeps me up to date with my very busy life haha. So intimate peter ended today and I’m still collecting items? I just 2 censored, my last 2. On my characters it still has the items for Peter,..? Sometimes your device doesn’t fully sync with changes. I am thankful for fun things like this contest, family, fun games, and this fun site! Thanks for another great contest and for all you do to keep us updated and to maximize our fun. Happy Thanksgiving! I am thankful for this amazing game! So entertaining! I am thankful that everyone I know is (at the moment) is healthy and happy! I am also thankful for having this game, for when those happy and healthy people get on my nerves! I never win anything, this would be too cool. I’m thankful for the family guy and American dad shows, because having a fun smart shows to watch when most channels are showing reality shows or the same old stuff we seen before. Hi guys, this site has helped me so much. Thank you for everything you do. Does anyone know when this event finishes European time? I’m one peter toy away from getting the new outfit and things are feeling tense! !